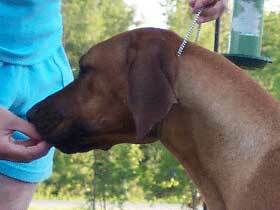 Rhodesian Ridgebacks come in what might appear to be, several colours. 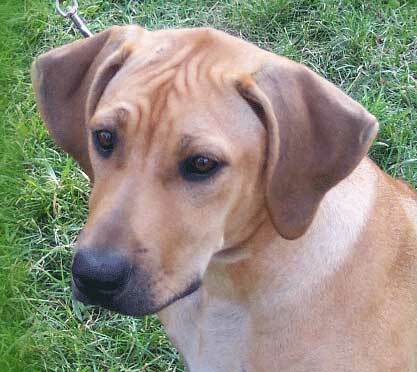 In fact it is several "shades" of the same colour - we refer to it as "wheaten." ranging in colour from light tan to reddish ...... and it seems to change colour as the wind blows. 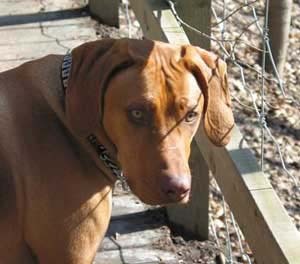 This is similar to the effect referred to as wheaten when speaking of Ridgebacks. Each individual hair is banded - lighter at the base, darker at the tip. In the cat world, breeders refer to this as "ticking"
to honey-gold to red wheaten to a very dark red. 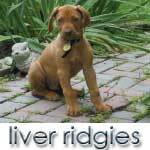 While we are discussing colour ... there is also something we refer to as a "Liver-nose"
- the more commonly seen black nose, and the less common brown or "liver" nose. Both colours are equally correct. and intense stare from those light eyes.